Thriive Applications have closed for this year! Over the last few days, the Hue Thriive Team have been busy responding to last minute questions from applicants about the Application Forms and Thriive Program. We'll be reviewing the applications shortly and will form a short list of candidates. Some really great candidates have come through and we can't wait to speak to them further and to conduct site visits once the short list is formed. Participating in the Charitable Giving Ceremonies last week has been really inspiring and we're motivated to create the same, if not better, impact for Recipients and community members through the donations of the Thriive Businesses that will come through this year. This is my last week in Hue, Vietnam for my fellowship! The past few weeks have gone past so quickly. I find myself stumbling upon the same feeling as I had when I first arrived in Hue all those weeks ago - feeling that its all so surreal that its actually the end of my fellowship. Ah, I will miss the street vendors, which are so ubiquitous and so unique to Vietnam. If you're ever hungry, you can just have a steaming bowl of noodle soup literally in front of your door step, and its made in seconds. There aren't that many places in the world that gives you that kind of efficient customer service and that delivers such quality fresh food. I had wanted to come here to create personal impact within the community through my work. And now that I am leaving, I find that the greatest impact witnessed is the change within myself - a very significant form of "personal impact" indeed! We held another Charitable Giving Ceremony today to donate 120 books to students of ethnic minority descent at a rural school outside of Hue City. The students were so excited to receive the donated books, but when we start taking pictures of them, that's when the excitement levels really peaked! All of a sudden, we were surrounded by squealing and laughing children making "peace" signs, giving us high-fives and squeezing our hands. It was so cute! Love this part of the fellowship! Some pictures below. Summer break has ended and a new school year has begun in Hue city, Vietnam. All across the city, many students are equipped with clean, crisp uniforms and new notebooks that traditionally mark the start of a fresh school year. 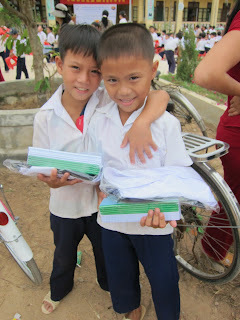 However, there are many students in Hue and the neighboring rural areas that do without these items. Such students, usually do not have the luxury of fresh uniforms every year, often wearing the same set of uniforms for a number of years, or wearing hand-me-downs from older siblings or donated uniforms of village/community members. Other students re-use school books, by erasing the existing text in the notebooks that they used the year before or those donated by community members, and then writing fresh text on top of the erased content. Thriive Businessses are businesses that are the recipients of the ThriiveCapital Loan, which they repay by donating goods that they produce to Hue community members in need. This week, we held a number of Charitable Giving Ceremonies during which Thriive Businesses repaid their loan through donating new school uniforms and notebooks to students from disadvantaged backgrounds. We held Thriive Charitable Ceremonies at each of the schools and children shelters that were selected as Recipients of the donated goods. This week we will hold four Charitable Giving Ceremonies to schools/shelters, and donating a total of: 419 sets of uniforms, 4550 notebooks, 4 dinning tables, 1 First Aid cabinet, 2 filing cabinets, 4 book shelves, 6 large study tables, 4 sets of individual study tables and 2 chairs, 4 sets of individual round tables and 5 chairs. The students at the ceremonies were really so cute (they loved the fact that we had cameras on hand and had no hesitation to pose for some adorable shots) and had huge smiles on their faces when they received their new supply of goodies! The Thriive Businesses and parents in attendance of the ceremonies were also very pleased. It is very rewarding to see the culmination of all our work and to see the concerted charitable giving of Hue businesses supporting Hue community members. Copyright (c) 2006 The Vietnamese American Scholarship Foundation. All rights reserved.